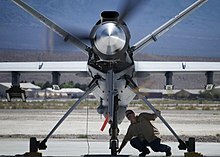 ↑ "'Reaper' moniker given to MQ-9 unmanned aerial vehicle". US Air Force. 14 September 2006. สืบค้นเมื่อ 1 January 2012. ↑ "MQ-9 Reaper / Predator B". Globalsecurity.org. 13 May 2010. สืบค้นเมื่อ 8 September 2010. ↑ "Reaper UAV To Receive Improved Targeting From Raytheon". SatNews.com. 24 September 2008. สืบค้นเมื่อ 8 September 2010. ↑ "MQ-9 Reaper Hunter/Killer UAV". Defense Update. สืบค้นเมื่อ 8 September 2010. ↑ "Lynx / AN/APY-8". Defense Update.com. 23 August 2006. สืบค้นเมื่อ 8 September 2010. ↑ "AN/DAS-1 Multi-spectral Targeting System (MTS) - B (United States)". Jane's Electronic Mission Aircraft. 15 March 2010. สืบค้นเมื่อ 8 September 2010. หน้านี้แก้ไขล่าสุดเมื่อวันที่ 4 สิงหาคม 2560 เวลา 01:45 น.